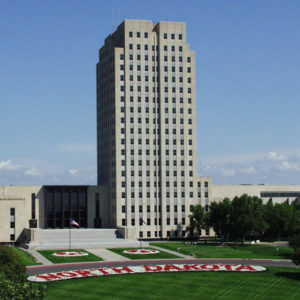 For the first time in its history, the North Dakota judicial system asked the state legislature to increase its budget in order to cover a deficiency in funds. The 1.5 percent increase was necessary to handle the nearly 575 protest-related arrests made since this summer. Quite simply, the state doesn’t have enough judges and clerks to process trials in a timely fashion. Meanwhile, a state public defenders’ group is also considering asking for additional funding. These requests are just one more facet of the intense strain that the Dakota Access Pipeline protests are putting on the state’s budget. Although law enforcement has been the visible face of the state’s struggle to maintain the peace, other state agencies, including the courts, have been swamped by protest-related activity. North Dakota’s Commission on Legal Counsel for Indigents, which currently has 65 defenders, has accepted more than 225 protest-related cases and is seeking to add an additional 7 attorneys. Already Sally Holewa, the state’s court administrator, has expressed concern that the workload is infringing on the defendants’ rights to a speedy trial. And that takes more money, forcing the state to increasingly draw on its emergency funds. In a press conference earlier this month, area law enforcement expressed frustration that the state and local governments have been left to front the costs of a decision made at the national level. While the Army Corps of Engineers reconsiders the environmental impact of the pipeline, North Dakota is left to foot the bill and has yet to receive aid either in the form of money or manpower. The state has already been forced to draw upon emergency funds to cover the costs. On Wednesday, North Dakota Emergency Commission members approved an additional $7 million line of credit to fund emergency law enforcement in the protest area. The latest request comes on top of $10 million in emergency funds that have already been loaned. Officials say that the money should be sufficient to cover law enforcement costs through the end of the year. As the protests drag on North Dakota has been left unsure if any of the expenditures will be reimbursed in the future. Meanwhile, the North Dakota government has been backing off of some of its harsher stances against the protesters. In a press conference this afternoon, Gov. Jack Dalrymple clarified that the mandatory evacuation order he issued on Monday would not stop people from entering the camp to bring food, water, or clothing. Instead, the order serves as a warning that the camp’s location makes it likely to flood if ice jams form on the river, as they likely will. “We have never discussed removing anyone from the land forcibly,” he said. Without a forced evacuation order, the protests will continue. As the heavy snows and harsh winds of winter continue, local law enforcement will remain at the protest site, hoping that federal assistance will come.